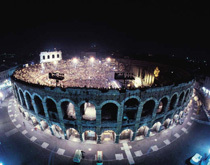 Taking in an opera at Arena di Verona, Verona’s world-famous Roman amphitheater ranks as a must for any opera lover. The venue which holds 22,000 people is the best preserved structure of its kind. Almost every night during the summer, spectators sit under the stars, holding small candles, continuing a tradition started by the ancient Romans. Not only is the amphitheater larger than life, but so too are the sets and special effects as well as the glorious voices of some of the world’s best opera singers. The acoustics are perfect. Aida, Romeo and Juliet, La Traviata, Nabucco and The Barber of Seville will be performed this summer. Verona, famous as the setting for Romeo and Juliet, is a delightful place to spend a few days. The Rossini Opera Festival (also called the Pesaro Opera Festival by musicians) is in its 31st year celebrating the works of Gioachino Rossini in the town of Pesaro in the region of Le Marche. Pesaro is a lovely seaside resort on the coast of this small, authentic Italian region. The festival combines the genius of Rossini’s work with the beauty and relaxation of a coastal location. One of the purposes of the festival is to revive and bring attention to some of the composer’s lesser known works. This year will see performances of The Barber of Seville, La Scala di Seta, Mose in Egitto and Adelaide di Borgogna. The Puccini Festival takes place in the stunning Tuscan lakeside town of Torre del Lago, close to the Villa Mausoleum where composer Giacomo Puccini lived and is now buried. Thousands of spectators enjoy Puccini’s creations in a spectacular lakeside open-air theater. Opera greats such as Giuseppe Di Stefano, Luciano Pavarotti, Placido Domingo and José Carreras have all performed here. La Boheme, Madame Butterfly, Turandot and Mameli are scheduled for this summer. Taking your first trip to Italy? Learn everything you need to know when you get your FREE copy of The First Timer’s Guide to Italy by ItalyTravel.com contributor Kathy McCabe. Ready to plan your Italy vacation? Perillo Tours has been leading group trips throughout Italy since 1945 and ItalyVacations.com can custom design an independent itinerary for your dream Italy vacation!